Well, it’s official: The Democratic dam broke on Wednesday in demanding VA Secretary Eric Shinseki’s resignation after an inspector general’s preliminary report confirmed long wait times and misconduct at VA hospitals. The first Democrat to call for his resignation was Sen. Mark Udall (D-CO), who’s in a competitive race for re-election. Next was appointed Sen. John Walsh (D-MT), who’s also running a tough race. Then came Sen. Jeanne Shaheen and even Al Franken (!!!). So now that the dam is broken, the questions become: WHEN does Shinseki resign, and WHO replaces him? We’ve already heard some names of possible successors (Ray Odierno, Bob Gates, even Stanley McChrystal), but those folks might be wishful thinking. What the White House is probably looking for is someone who has experience moving and managing a bureaucracy. Maybe more importantly, it needs a big (or politically satisfying) name to move the story away from the political arena -- especially given the upcoming midterms -- to fix the problems at the VA. So they need to find someone, and find him or her quickly. But they’ve also got to find the right person, too. 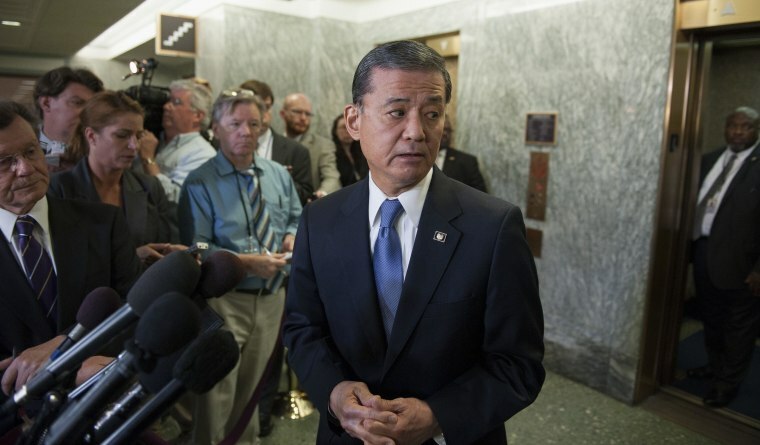 Shinseki doesn’t go until the White House finds a suitable replacement. They know they look like they’ve been slow to respond on this; the last thing they are likely to do is simply leave a void at the top of the VA while they try to find a replacement. And that appears to be where we’re at right now -- searching for a replacement. Regarding Edward Snowden’s primetime interview with NBC’s Brian Williams, the question becomes: Did it change opinions about him? For the first time for many Americans, they can now attach a voice to the man they’ve probably seen in still photos over the past year -- and that might evoke a little more sympathy for him. (His fav/unfav in the July 2013 NBC/WSJ poll was net-negative 11%-35%.) And if so, does that move the Obama administration to negotiate with him over some kind of clemency? But he made it clear to Williams that he wants to come home. “I don't think there's ever been any question that I'd like to go home. I mean, I've from day one said that I'm doing this to serve my country. Now, whether amnesty or clemency ever becomes a possibility is not for me to say. That's a debate for the public and the government to decide. But if I could go anywhere in the world, that place would be home.” One thing Snowden already has going for him in any high-profile negotiation is that he has some members of Congress on both sides of the aisle that are sympathetic to his cause, even if they aren’t sympathetic to his methods. The Obama administration may be more willing to negotiate than they have indicated publicly if Snowden is serious about at least coming home and facing SOME music (i.e. jail time). As for President Obama’s foreign-policy speech yesterday at West Point, Jeffrey Goldberg had a thoughtful take trying to explain why the speech wasn’t so well received by the bipartisan foreign policy community. He argues that Obama has made no serious foreign-policy mistakes or missteps as president, but that his foreign policy lacks ambition and passion. “[S]o far Obama has not driven the U.S. into a Middle East ditch or into the South China Sea… “[B]ut when he talks -- not necessarily in grand settings, such as today’s speech -- but with foreign leaders, Congress and the news media, he often sounds as if he’s auditioning for the role of foreign-policy analyst on the PBS ‘NewsHour.’ It's all logic and dispassion and half-measures. Foreign policy, for him, is a management challenge: containing threats, quieting unhappy allies, limiting damage. There is no particular vision associated with his detached, cold-eyed approach to foreign affairs.” In his sixth year in office, it’s easy to group Obama among the past foreign-policy realists in the Oval Office -- think George H.W. Bush, even Eisenhower. And both were quite dispassionate. But style does matter, and Bush 41 and Eisenhower were of another era. So whether Obama likes it or not, style matters a bit more these days. Of course, so too do results… And as with every president, one can’t truly judge the success or failure of a president’s foreign policy until a few decades after he leaves. The biggest news Obama made in his speech was on Syria -- the United States has ramped up its efforts to assist the moderate rebels there. “As president, I made a decision that we should not put American troops into the middle of this increasingly sectarian war, and I believe that is the right decision,” he said. “But that does not mean we shouldn’t help the Syrian people stand up against a dictator who bombs and starves his own people. And in helping those who fight for the right of all Syrians to choose their own future, we are also pushing back against the growing number of extremists who find safe haven in the chaos.” So Obama has made the decision that Syria is now a problem that can’t be ignored. Remember all of the attention that Georgia Senate candidate Michelle Nunn (D) received over the question of whether she would have voted for the health-care had she been in the Senate in 2010? Well, Senate Minority Mitch McConnell is getting similar scrutiny for calling for Obamacare’s repeal but not for the state’s health exchange, Kynect, which was created under the health-care law. An editorial from McConnell’s home state Lexington Herald-Leader: “What in the world did [McConnell] mean last week when he told reporters that repeal of the Affordable Care Act — ‘root and branch,’ as he has demanded many times — is ‘unconnected’ to the future of Kynect, Kentucky's health insurance exchange? Asked specifically if Kynect should be dismantled, McConnell said: ‘I think that's unconnected to my comments about the overall question.’ Huh?” And the Grimes campaign has hit back: “McConnell has voted to destroy Kynect — and he has said he will do it again. In the U.S. Senate, Alison Lundergan Grimes will fix the law to ensure it is working for all Kentuckians.” Of course, there’s a reason why Democrats want to talk about “Kynect” (which had a 29%-22% fav/unfav in a recent NBC-Marist poll of Kentucky voters), and why Republicans want to talk about “Obamacare” (a 33%-57% fav/unfav). The three-day Republican Leadership Conference confab begins today in New Orleans. Here’s a schedule of the speakers: On Thursday (beginning at 7:00 pm ET), RNC Chair Reince Priebus, Louisiana Gov. Bobby Jindal, Wisconsin Sen. Ron Johnson, and Phil Robertson of “Duck Dynasty” speak. On Friday, (beginning at 1:00 pm ET), it’s former Mississippi Gov. Haley Barbour, Donald Trump, Louisiana Sen. David Vitter, Utah Sen. Mike Lee, and Newt Gingrich. And on Saturday, it’s Sen. Texas Ted Cruz, Iowa Rep. Steve King, and Texas Gov. Rick Perry. Lastly, we wanted to officially announce that former Grio and Washington Post reporter Perry Bacon is joining our political team. You’ve already seen his work here, as well as on NBCNews.com. But you’ll be seeing a lot more of it. Welcome, Perry!